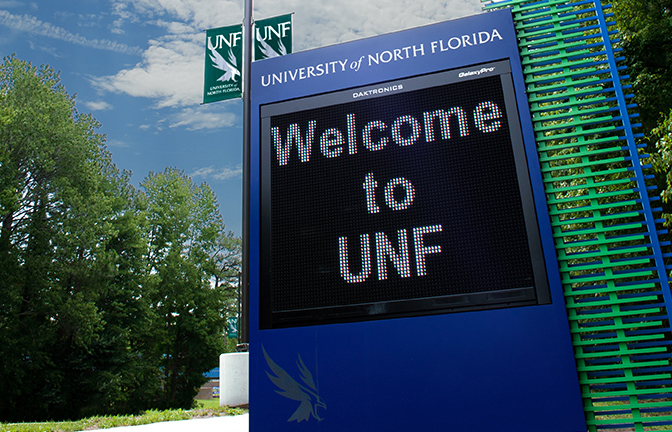 Whether you’re a freshman starting college for the first time or a transfer student new to UNF, one of the obstacles you might face in your transition is ‘Not knowing what you don’t know.” Well, let us enlighten you! One of your best resources on campus is your academic advisor. Your academic advisor will make course recommendations based on course work you have already completed, credits you may have earned through credit by exam (such as AP, IB, AICE, CLEP, etc.) and, of course, your intended major. He or she will help ensure the classes you register for will satisfy requirements for your degree and help keep you on track to graduate on time. It is important to note that incoming freshmen are required to meet with an academic advisor prior to registering for classes. Typically this is done through the UNF orientation program. Transfer students are not required to meet with an academic advisor, but it is strongly encouraged. Have an idea of what days/times you want your classes. Log into your myWings account and look up the courses your advisor suggested to see how you can piece them together in a schedule that works for you. Repeat this process several times because the classes you want may not be available when it comes time to register. Having back-up schedules is a really good idea. It is VITAL that you clear any registration holds on your account prior to when course registration begins. You can see your holds in your myWings account. Most students will have a few standard holds. Many of these holds can be cleared immediately by reading a few disclosures. However, others, such as the State immunization requirement, may require you to submit supplemental paperwork to clear the hold. Registration Time Tickets are assigned in a certain order. With some exceptions, your Registration Time Ticket will be based on the number of credit hours you have earned. Students closer to graduation get to register first for the best chance to get into the classes they need to graduate. Unfortunately, this also means that new freshmen and lower-level transfer students will get later Registration Time Tickets. Finally, Registration Time Tickets are NON-NEGOTIABLE. So with a little planning you can make sure you don’t end up taking Underwater Basket Weaving at 8:00 am on Saturday mornings (ok, that isn’t really a class, but you get the point). Below is a list of additional resources to help you through the registration process. One Stop Student Services is exactly what its name suggests. You can call, email or stop by their office to get help with your registration questions, holds, financial aid, and much more. ACE is UNF’s advising office for freshmen and sophomores. They will help ensure you don’t take classes you won’t need and that you fulfill any prerequisites that are required for your intended major. Each college and many programs have designated upper level advisors. These advisors will help you make sure you are completing your graduation requirements.